Reggae music has been recognised by UNESCO as part of the Intangible Cultural Heritage of Humanity. It's about time they did. I have loved reggae music since June 1978 when I first heard King Tubbys Meets Rockers Uptown by the wonderfully named Augustus Pablo. I first heard this legendary track on an Island Records limited edition 12" single. The track is 2' 30" of pure thunder and lightening, not just pure Jamaican reggae, but one of the most stunning Jamaican dub reggae tracks of all time. The Jamaican electronic and sound engineer Osbourne Ruddock (1941-1989), was born and raised on High Holborn Street, which is close to the harbour in Kingston Jamaica. As a teenager, Ruddock began studying electronics through American correspondence courses and at the College of Arts, Science and Technology in Kingston. After leaving college he set up a radio repair shop in Kingston, and from his repair work he began to take an interest in repairing and making electronic equipment and amplifiers for local recording studios and sound systems. Ruddock was technically gifted as an electronics engineer: in 1961 he built his own radio transmitter, from which he briefly broadcast a pirate radio station. Throughout the 1960s, Ruddock built a reputation as an electronics engineer, a sound-system operator, and a remixer of vocal reggae tracks. By 1971, he had converted the front room of his house on Dromilly Avenue, Kingston, into a recording and remix studio, and had begun releasing re-worked versions of vocal reggae tracks under his stage-name of King Tubby. Within this modest physical space, King Tubby taught himself how to play his studio as a musical instrument. He explored how his analogue mixing deck, sound effects and tape recorder could be used to strip away the original structure of a reggae vocal track, leaving fragments of the original vocals, keyboards or horns, and emphasising the percussive drive of the drums and the thunder of the original bass line. This process stripped back the layers of a song’s body, to leave exposed both the skeleton and viscera of the track. Through a painstaking process of musical prosection, King Tubby helped to create dub reggae. Much of what is now known as remix culture in modern music can be traced back to the sonic inventiveness of Ruddock: playing with tape delay, high and low pass filters, echo, reverb, phasing, and modulation, in his home-made studio in Dromilly Avenue, Kingston. Some of Ruddock's most distinctive albums are collaborations with the producer and multi-instrumentalist Augustus Pablo (1953-1999). Pablo was born Horace Swaby, in the middle-class Havendale district of Kingston, Jamaica. He attended Kingston College as a teenager, where he learned to play piano. By the late 1960's, Swaby had become a committed Rastafarian and had begun working as a session musician for the Randy's Studio house band. In 1969 he began playing melodica - a small, cheap, mouth blown keyboard that was made for teaching children basic keyboard skills. He released his first instrumental tracks in the early 1970s under the pseudonym Augustus Pablo, and from then until his early death in 1999, he produced hundreds of vocalists, and released a string of haunting reggae instrumental albums featuring his trademark Far East sound, based on minor key melodica motifs. 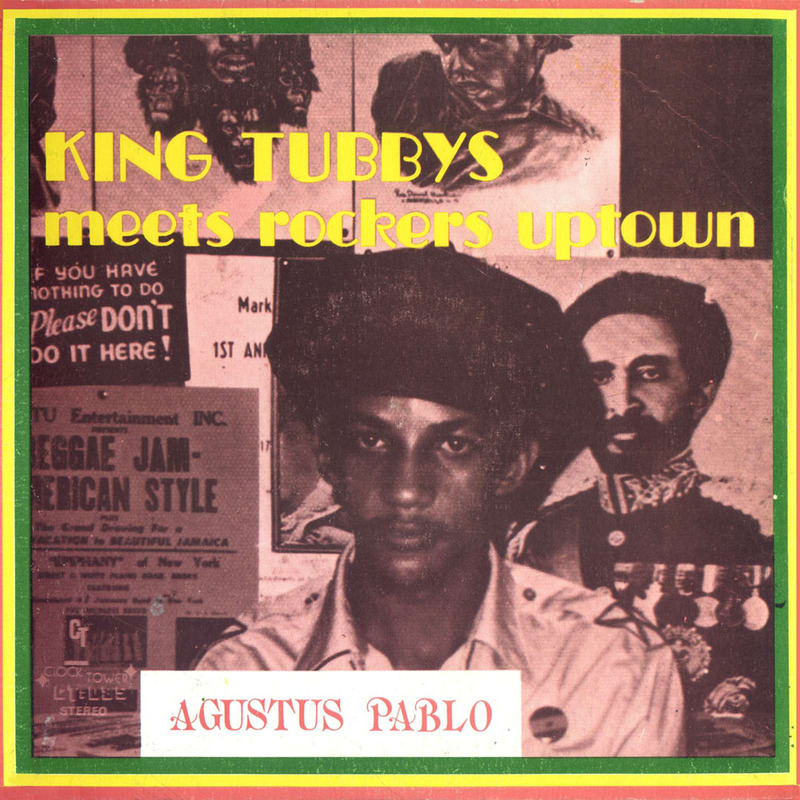 The collaboration between King Tubby and Augustus Pablo is exemplified in the album King Tubbys meets Rockers Uptown, which was first released on the Yard label in Kingston in 1976, though individual tracks had been released slightly earlier as singles. This is a foundational record in the development of Jamaican music. It is considered by many experts to be one of the greatest of all dub reggae albums. By construction, each of the 11 short tracks on the album is a radical re-working of an original vocal track. The combined talents of King Tubby and Augustus Pablo mean that not only were the original vocal tracks stripped back, but new rhythms were created by King Tubby through echo and reverb, and subtle shifts in mood were created by Pablo. This music has had a profound influence on modern music, as much for the remix approach it took to re-working an existing musical track in an inventive way than through musical similarity. Tubby built his studio using mixing desks that were discarded and considered obsolete by Federal recording studio. He modified these decks by adding unique electronic circuitry of his own design, and then he and his collaborators ET and Lee Perry, explored the outer edges of what this relatively modest technology was able to do. Pablo did the same with the low-tech melodica keyboard. Tubby did not record musicians. He took pre-recorded musical tracks and added vocals and some over dubbed music - such as the melodica motifs of Pablo. He pushed to the outer limits the capability of the recording technology he had at his disposal. At this stage… recording technology was beginning to imply for reggae what improvisation had already implied for jazz: the notion that a ‘composition’ must now be understood as a composite of its endlessly multiplying, mutating, and potentially infinite elaborations over time.